Second to last in the series, this is a Masyu Reconstruction. The one on the contest turned out to be pretty similar in style. The type could also go another way, with a heavier focus on making a puzzle unique with few givens. 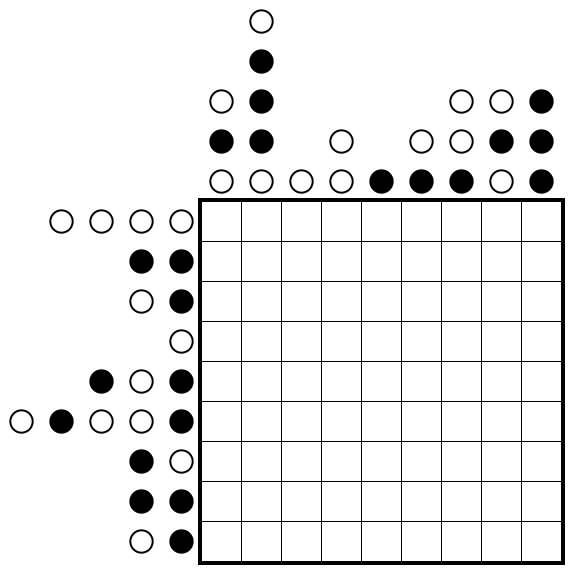 Rules Place black and white pearls in some cells to form a valid Masyu puzzle, such that the clues in a row or column are equal to the outside givens in that order. This entry was posted in Puzzles and tagged hard, masyu, masyu reconstruction, variant on 2014-06-27 by rob. Here’s another one from the LM preparation. EDIT: new version fixing an ambiguity. Rules Shade some cells, such that there’s at most one unshaded copy of any number within a row or column. Shaded cells must not share an edge. Then draw a single loop that travels horizontally and vertically between cell centres that visits all unshaded cells. This entry was posted in Puzzles and tagged hitori, loop, medium, variant on 2014-06-26 by rob. Another training puzzle, this is a 123 box, a variation on the ABC box that was introduced at the German Logic Masters. Also, I’ve posted a Doppelter Rundweg on the puzzle portal. That one is probably the hardest puzzle I’ve constructed to date. Rules Put a number from 1 to 3 in each cell. The hints correspond exactly to connected groups of equal numbers within that row/column. A number clue stands for a group that consists of that number, or is that size, or both. A question mark clue stands for an arbitrary non-empty group. 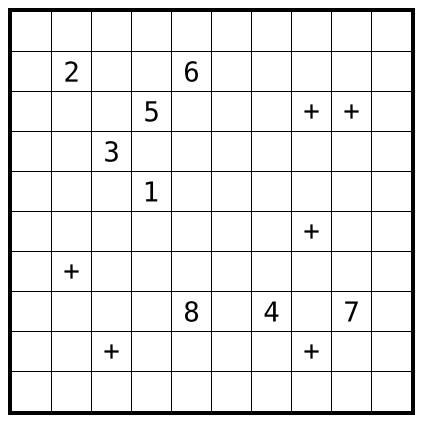 There’s an example with the (German) instructions on the puzzle wiki. This entry was posted in Puzzles and tagged 123 box, ABC box, hard, variant on 2014-06-25 by rob. 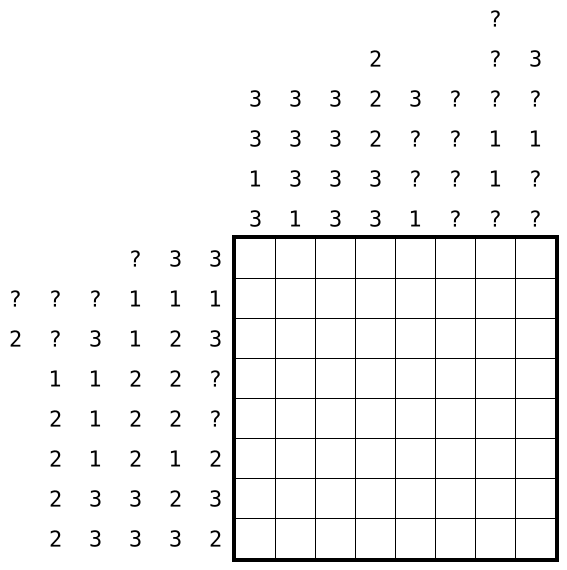 Here’s a Hitori puzzle that I made a while back. Which gives me an excuse to advertise the German Logic Masters that take place in Stuttgart on Saturday, which include a Hitori-themed round among others. 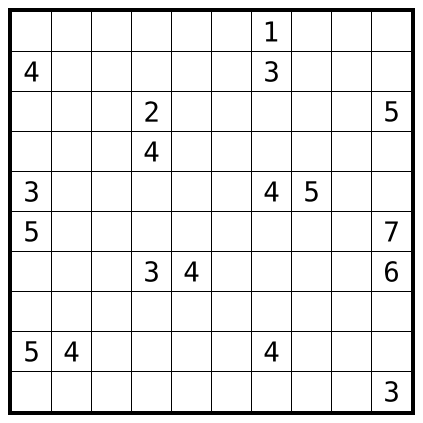 The instructions were published this weekend, it promises to be an excellent set of puzzles. What’s more, this year the contest will also be offered online with a slight delay, see this forum thread. This entry was posted in Puzzles and tagged hitori, medium on 2014-06-17 by rob. 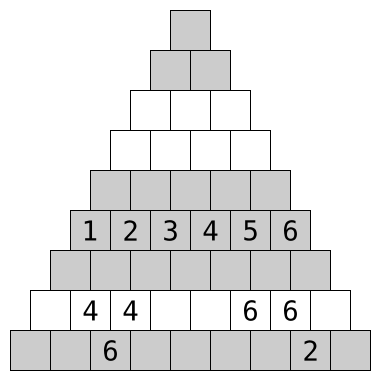 Here’s a “knapp daneben” pyramid puzzle, i.e., all clues are off by one. Please excuse the slight asymmetry, it’s because the bottom clues including gaps were meant to be transferred from other puzzles. It’s fall-out of a puzzle contest I’ve helped write, together with the Berlin Stammtisch, which will be held on the weekend of June 28. See the instruction booklet. 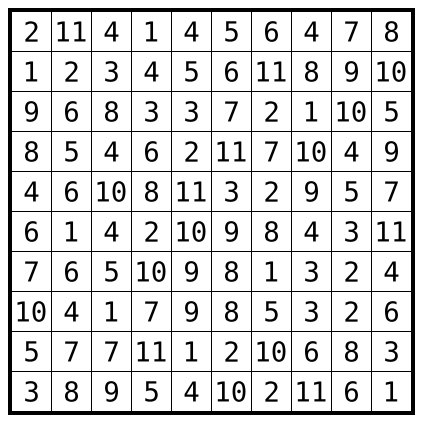 Rules Place a number from 1 to 9 in each cell, such that for any two horizontal neighbours, the number between and above the two is their sum or their difference. 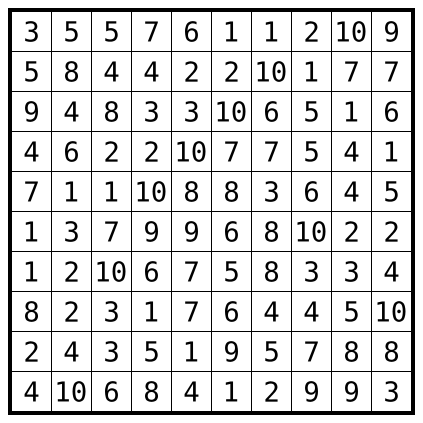 In gray rows, all numbers must be distinct, while in white rows, there must be at least one pair of duplicate numbers. All given numbers are off by one. This entry was posted in Puzzles and tagged knapp-daneben, medium, pyramid, variant on 2014-06-06 by rob.